The similarities and the differences between the classical slave and the modern order taker 8. As I have announced in the first entry of this series, and as we have consistently shown throughout it, there are amazing resemblances between the classical slave and the modern order taker. This fact is totally normal as the two social states continue one another in a relatively short time. In France, the abolition of classical slavery was made only in 1848. Initially, the abolition was attempted in 1794 with the famous French Revolution, but it was a temporary measure like the Revolution itself. In 1802 Napoleon I reinstated it. The British Empire slavery abolition was made with small steps between 1830 and 1860. In the US the classical slavery became the object of the famous war between the North and the South, and was actually abolished in 1868. There are no radical revolutions in human society, but only small changes that take place over time. The 150 years is too little for such a total change. So it is quite a naivety to think that what functioned in the entire classical era of about 5000-6000 years would have disappeared altogether in 150 years. In fact, the slavery principle remained the same: some people execute the orders of other people without really wanting to do so according to their free will, but as a result of external pressures. The theories about abolishing slavery are only an ideological fraud, one of the biggest in human history. In fact, the slavery just changed during this time. We are more justified to talk about the classical slavery transformation into a paradoxical free slavery. Only nowadays there are clear signs of a total opportunity to eradicate it by automating work that increasingly takes over. In this entry I showed in detail that today’s some people life is much closer to the classical slaves’ life than is different from it, beyond the general Western society evolution, especially on the technological side. Marx considered that the main negative aspect of the 19th-century industrial society would had been that the worker were not paid for the true value of the work that has done, as the employer had kept the profit for itself (the plus-value theory). Indeed, the labor-retribution exchange deception is an important sign of slavery infiltrating in free work relationship. But this sign is not universal. For example, a child who mimics the adult's work without being paid for it is not necessarily a social exploited person. In the same way neither an adult is a socially exploited person only because not being paid for its work. If he wants to do something new, for fun, without any claim to be paid, out of its pure pleasure to doing that activity, then that is called amusement rather than social exploitation. As I have already said, it is also not slavery the satisfaction of giving it an advantage to a friend, an animal or a child. All these come from within, from human nature will, without external pressure from the profit opportunists. The unfair profit sharing between the employee and the employer according to the worker’s labor (the plus-value theory) is only an external sign of this unfair slavery relationship, but not its principle. The working relationships of the 20th century neo-bourgeoisie society have countered this Marxist idea, of describing the 19th century bourgeois society working relations, by substantially increasing the modern order taker income. I am not talking here about the developing countries cases that seem to be stagnating even in previous centuries of the 19th one in terms of decent income. I am strictly talking about the cases of those who work for decent wages in developed Western countries. The employer's profit remained about the same comparing to the 19th-century society that Marx spoke about. But, unlike the 19th century, the 20th and 21st century western employee earnings are large enough to cover two, three times or even higher the daily needs. So the unfair profit-sharing that the plus-value theory stipulated can no longer be justified, in this case. The modern employee can afford the food and housing excess and wasting. 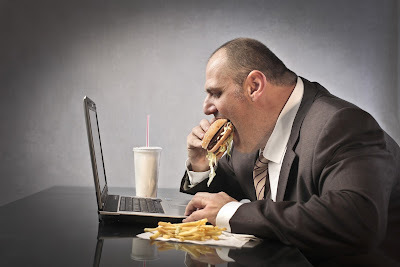 In western countries the obesity became a problem in the last hundred years. Their homes have unused rooms. Moreover, there are enough people who can change the house, the car, the holidays destinations for resting, and after these spendings, they still have money left from the previously obtained income. So the extra money receiving in addition to the already unspent money, thus realizing the absolute cancellation of the plus-value, would not change much the modern order taker life. These consumerist excesses and wasting simply create the false illusion of stability in the modern order taker mind. But beyond these illusions, she/he is terrorized with negative news , bombarded with advertisements that urges her/him to eat even more and more, as constantly being threatened with throwing in the street and thus keeping contributing to the medical insurance whose services constantly needs like a racing car who needs maintenance and reparations after each competition. This employee works from morning to evening under stress and only takes a period between 2 and 4 weeks rest in a year. During this rest time that person is served by other employees as she/he served the bosses the rest of the year. We can notice here a very strange resemblance to the Greek and Roman aristocracy custom of exchanging the social positions with their slaves for one particular day in a year. Unlike in those times, in the modern age we can see that the number of days of this "rest period" has increased. We have become accustomed to this daily life situation, but if we ignore this accommodation, even a child can say that the 2-4 freedom weeks, from the legal resting period per year, is not a fair exchange for the rest of the year hard work. Although the modern order taker life was the ideal of the most 19th-century workers, yet the profile of this person is far from being a truly free. That is why these people are profoundly unhappy with their life. They constantly want a change that surprisingly looks like classical slave’s need to escape the master’s domain. That's why the modern order taker keeps changing its car, house, and sometimes even its own family, starting it all over and over again. We see now how the slavery system actually has improved in the meantime, but not quite abolished. This system allows the modern order taker to such changes in her/his life. Moreover, it even encourages her/him to do it. The media ads lure her/him to buy a bigger house, a better car, and more. But those things come with the price of an even larger amount of work for the extra money needed to buying them. Here's how the system has managed to make profit even from this classical slave compulsive tendency to escape from its exploitation state! The absolute grotesque of this false state of freedom can be metaphorically observed in the previously mentioned obese consumer. Although that person is overweight, she/he still continues to eat a ton of pizza, becoming the prisoner of its own body, just as the classical slave was the master’s facto prisoner. Although that person is suffocated by purchases of all sorts, she/he still wants more, choking herself/himself even more loudly. The more she/he wants to escape from consumption, the more her/his own body becomes her/his prison. Observing this person, we realize that the slavery has improved to such an extent after its misleading abolition that it has become part of the very being of the obese person, unlike the classical slavery that at least was an outward one. Instead of taking action, the authorities are encouraging obese people in their consumerism excess, severely punishing those who tell the truth about their monstrous appearance. Such artificially protecting actions from the authorities to a false self-image are strikingly similar to those of the perverse feeder who nourishes his female partner with more food. He holds her into his own immobility, and she becomes the slave of his own libidinal disorders. So does the social system with those consumerist mentalities. Because beyond the malignant food obesity there exists an equally malignant consumerist mentality at its base. We are talking about a new scholasticism cultivation of lies at the very deep level of the state ideology. In the next entry I will redefine the slavery concept according to these modern changes in order to include in it also this freedom caricature offered by the modern society.